Long ago, the Elyos and the Asmodians were one people known as humans. They lived together in the world of Atreia, in the shelter of the god Aion. But when Aion sent the draken to rule over Atreia, the peace was shattered. The draken grew more powerful, and awakened into the might Balaur. In order to prevent the genocide of the humans, Aion created 12 Empyrean Lords to fight the Balaur. The Empyrean Lords formed a protective barrier around the Tower of Eternity, allowing humans to regain civilization while the Millennium War waged around them. During this time, the Empyrean Lords began to take with them humans who had gained the same powers over Aether that they had. These humans became the Daeva, demi-gods thought to be angels sent by Aion himself. Now, even after the Cataclysm that split the world in two and separated the Elyos and the Asmodians, humans are chosen from both worlds to ascend and become Daevas, guardians of their people. As a Daeva, you, too, have ascended, and have earned your divine wings. After reaching level 9 and completing your Ascension quest, your character will gain the ability to fly. Flight controls work similar to that of other games, such as World of Warcraft. To take off and spread your wings, use the Page Up key; to fold your wings and land, use the Page Down key. You may rise by using R, and fall by using F; Space will place you into "glide" mode (which will glide you downward toward the ground.) You can enable an altitude lock with the Scroll Lock key. You can also fly using your mouse. Flight Time. 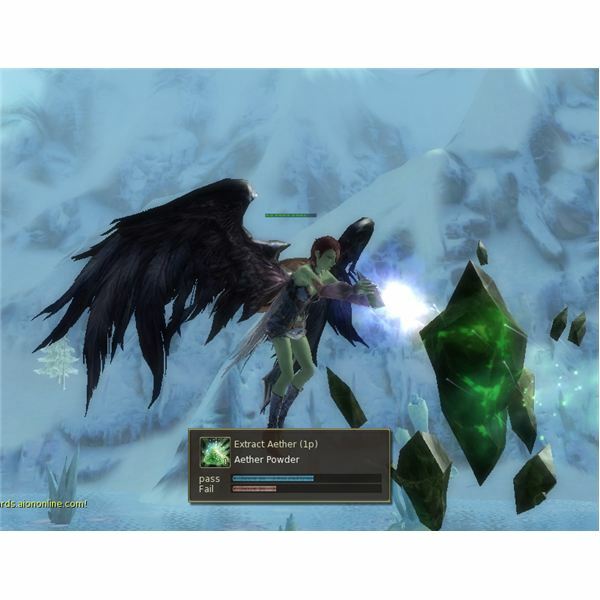 When flying in Aion, you are limited to how long you can be in the air, initially starting with a limit of one minute. This flight time, represented by the green "bubbles" around the Flight HUD (or above your head while in flight), recharges when you are out of flight (your wings must be fully folded.) If you plan to fly long distances, be on the lookout for places to stop and rest. If your flight time runs out while you are in the air, your wings will fold on you and you will plummet to the ground, possibly to your death. You can’t fly everywhere. There will be times when you are flying that you will be repelled backwards, and given the message "you cannot fly in this area". There are also areas you cannot fly in to begin with; your Flight HUD will be dulled if you can’t spread your wings in an area. 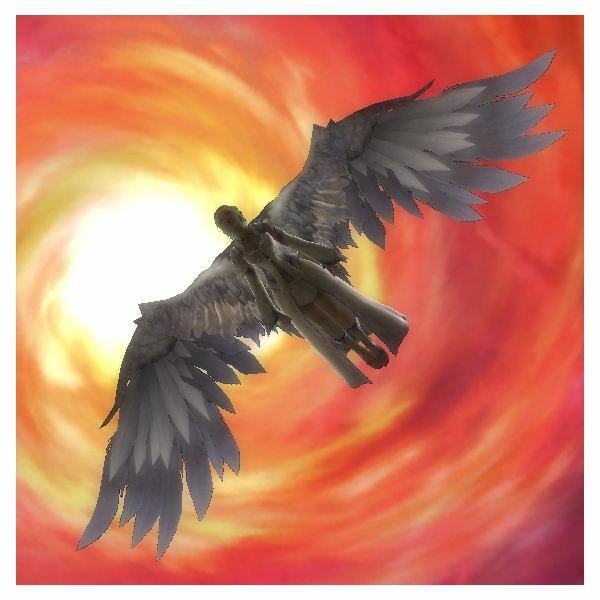 There is nothing like unfurling your wings and gliding through the world of Aion. No matter whether you chose Elyos or Asmodian, flight is rewarding, even when short. First, there’s the sight of your wings – and they’re yours, not that of another creature. For the Elyos, the white feathered wings are truly those of an angel; for the Asmodian, the dark black wings make you feel truly sinister. Then, there’s the enabling of flight: you can gain a vantage point, harvest Aether, take a quick flight over walls and other boundaries, and gain (or close) distance between yourself and your enemies. You can also fight while flying, a rare treat for an MMORPG. Despite the limitations of the flight mechanics, you’ll find yourself unfurling your wings often and waiting impatiently in between flights, flying everywhere within sight (or trying to), and hopping even short distances with your great wingspan. As mentioned earlier, however, flight in Aion is not all glorious. It takes getting used to, and it takes a great deal of awareness. You may find yourself seeing many death messages in the first few areas that allow flight – many people finding out too late that they’re too high with nowhere to land, or worse, having gone AFK while in the air. Gravity is, indeed, your greatest foe in Aion, especially at earlier levels. The higher you are from the ground, the greater falling damage you will take, and it doesn’t take too much height, even on a full health bar, to find yourself flattened if you fall. Although you will get a loud warning when you’re short on flight time, you may still find yourself too far from any safe place to land. It’s important to always watch the green circle that indicates how much flight time you have left. The trick? Just before you land, you can hit Page Up to briefly act as a slowing to your fall. Even breaking your fall like this takes practice, and I recommend practicing early if you plan on being an expert at flying as a Daeva. So be warned, flight must be made carefully when going long distances, in hostile territories, and especially while fighting in the air. Most of all, take heed to never go AFK while in flight – unless you want to come back to being a pancake. 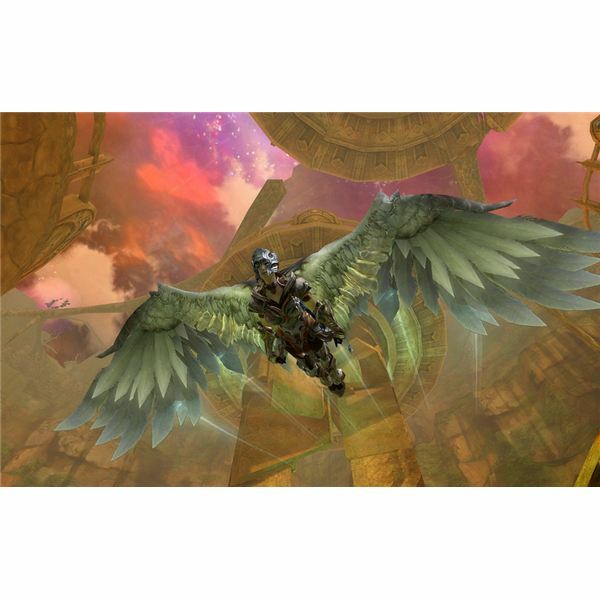 Aion also allows one more type of flight: gliding. Gliding is available everywhere, even in areas where normal flight is not allowed. It’s also a very useful and time saving skill, as it lets you travel faster than walking and can be used to catch up with the enemy in PvP. To glide, all you need is your pair of wings and a little bit of height. You can glide off small hills or large ones, so long as your altitude is higher than the rest of the terrain. Just jump off and use your wings with the PageUp key. Your character will automatically spread their wings and "glide" down toward the terrain, saving you falling damage and helping you cover distance. On long distances, your character can also ‘bounce’ every time they hit the ground, gaining them a little more air time. For more advanced gliding, try tilting your camera so that you look up as your character gains an updraft, and look down as they are descending. Still need tips? Check this gliding video guide. Here’s a look at flying in Aion, including how to fly in Aion, flight restrictions and mechanics, and some Aion flying tips.